Today I stumbled into this blog. I loved the style and I also found Ami's pinterest boards. Now, I've been using pinterest for awhile and I use it for all kinds of stuff, also for inspiration, but I found something in her boards I hadn't thought about. She would comment on which pattern it could be made out of. It hadn't occurred to me, mostly because I haven't been so familiar with a lot of patterns, but I'm starting to be. So when Ami suggested, that this one could be Laurel made from lace, I totally saw it! I wasn't originally very excited about Laurel, but after seeing what people have done with it, I'm starting to see the potential there. Then there was another pin for a trench coat, which made me think of the Robson pattern. Now, I'm not a black and white person (although I would so have shoes to go with this coat...). And I have a white trench coat, which is a pain because it gets dirty so easily, but I like the idea of the contrasting edges. I might use this at some point. Yes, still need to wait a bit for my finished challenge garments: I still don't have the lining fabrics! 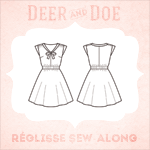 And I got an update on my order that the lining for Réglisse will be late... So, I might not finish in time... Hopefully I get it for next week.